So if you've read any other of my posts you will know by now that I'm at the beginning of my recovery process for my eating disorder, in my last post I said that it was going ok. That is still true. Considering thing are going ok at the moment I'd like to share a positive that has really helped me kinda eat more these past few weeks. That positive would be smoothies. I know its a little weird but please bear with me on this one. So I would say that I'm a little weird simply because I prefer fruit over chocolate, I have done for my entire life. Not necessarily because I think that fruit has less calories in it than chocolate (I have no idea if that is true, I hope it is though and I am assuming it is) but I just prefer the taste of fruit. Yes, i still will eat chocolate but I don't always enjoy it as much as everyone else, especially since I can see how many calories there is on a bar. But I'm not going to lie, before my eating disorder I would happily sit and eat a bowel full of chocolate ice cream if I was upset and thoroughly enjoy it. Above is a snap shot of my smoothie. In an attempt to get me to eat more my mum brought me a smoothie maker as a surprise. The one she brought for me was a Breville one that came with 4 bottles that were 2 different sizes, one was 300ml and the one above is 600ml. So everyday I make smoothies, usually when I get back home from college it's the first thing I do. 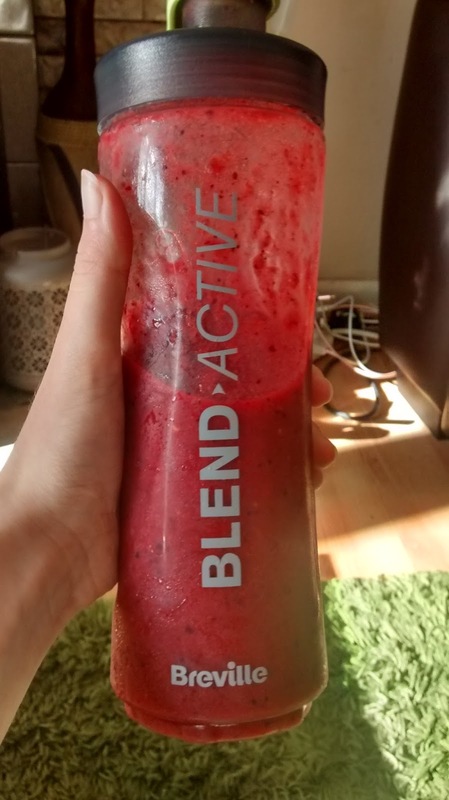 I don't like eating still, but I have no problem drinking a smoothie that I've made. I find that weird as I know how much stuff is in it. I know that there's a full banana in there, sometimes two, and loads of berry's, not forgetting some sort of fruit juice. If you gave me a bowel containing all of that and asked me to eat it I really doubt I would, not all of it anyway as I'd feel full and sick. Yet I have no problems drinking all of it in a smoothie form. I have no idea why having the stuff blended helps, but I'm not complaining. I am fully aware that I can't just live of blended food for the rest of my life, because I really doubt blended roast dinner would be nice at all. But it seems to be working right now. Fruit is good for you, especially if you put fresh fruit in it and proper fruit drinks that hasn't been loaded to the brim with added sugars. So I would really recommend trying smoothies out if you want to eat a little healthier or eat more. I don't know if this would work for everyone, but it does for me and that's all I care about personally. But it's worth a shot, especially as you can pick up smoothie makers quite cheep now a days as more of them are coming on the market. So yeah, smoothies is my one little positive that's really been helping me lately.